Hats. What would I do without them? 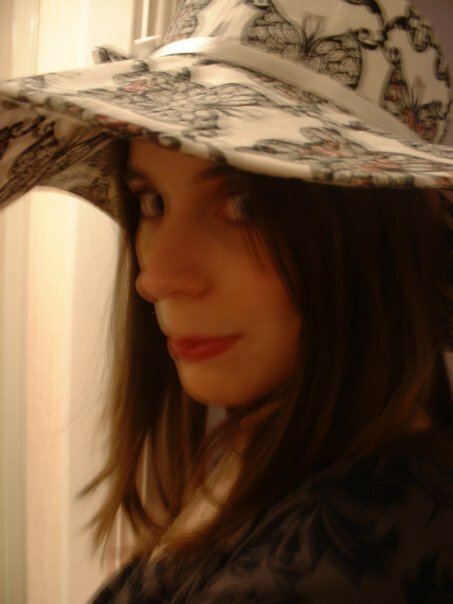 Who was I before I discovered the wonder of hats? A much less flamboyant version of myself, that's for sure. I discovered the wonder of hats around the same time that I decided to give up blending in and release what Sadye in Dramarama calls her 'Lurking Bigness' (I am reading that book at the moment. It is amazeballs). Once upon a time, I would have lusted over the hat from afar. I might have, in a moment of daring silliness, tried on some of the department store formal section offerings. Occasionally, I might have bought one - only to keep it in my cupboard, only wearing woolly hats on the coldest winter days or during the most scalp-burning summer hours and feeling self-conscious all the while. I have a couple of regular summer hats that fold up easily and are plain (boring) enough to go with anything. Here's one, a hand-me-up from my sister. Yes, that's the Colosseum in the background. I just don't wear blue that much. I have worn it a lot more recently though, so perhaps this hat will have its time soon! I bought it from Prangsta (warning: website will make you drool) - they have, or had, five years ago, a vintage section in the basement. It was £10. It still has the little pink label attached. I think this is the hat that really triggered the obsession. I just couldn't believe that I had bought something as silly and frivolous as a hat! I loved it. And proceeded to purchase several more hats of varying practicality and wearability. 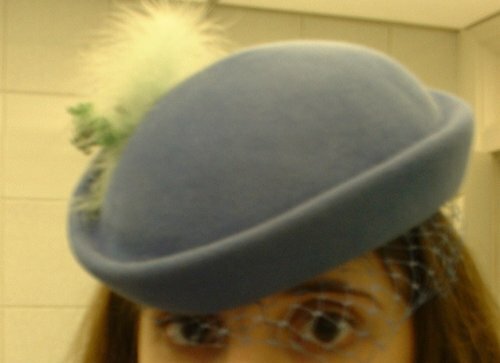 I've gone through phases of obsessive wear with most of my hats - I've got a green silk floppy one that I wore practically every day for a fairly long time, and a pale blue and a black one, both similar to the red one in the previous post, that have had a lot of wear. The dark red spiral mesh cap has been worn quite a lot as well, and I haven't even started telling you about my beret collection - I have four. But it is far too hot to be wearing and photographing berets, so I will leave you with this picture I took of Aprella at an Emilie Autumn concert, wearing a miniature top hat. I have wanted a miniature top hat since the moment I first saw one. One day I will find the perfect one, and actually persuade myself to hand over the funds for it. Shouldn't be too hard. Oooh. I love the first hat. From afar, the print almost looks like bats. And great tights in your Colosseum photo. Siouxsie - Thanks, I should really do a post on my tight collection next!